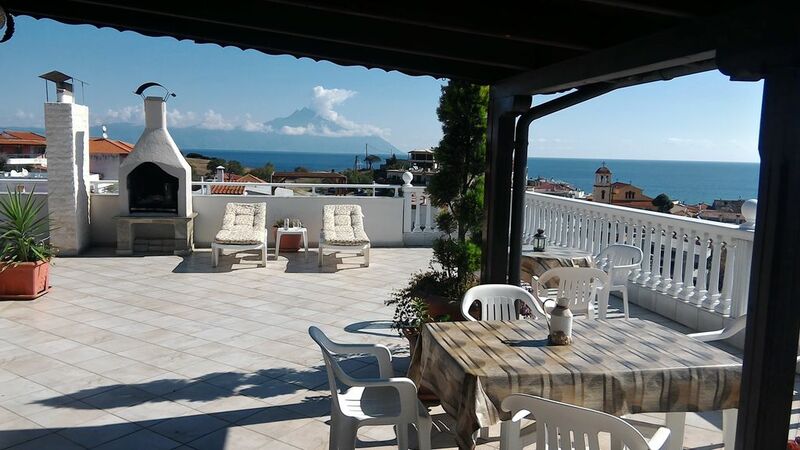 The apartment is in a two-story house with a number of other apartments and is located at the outskirts of Sarti. From all windows of the apartment you have an unhindered view of the sea, Mount Athos (the center of Eastern Orthodox Monasticism) and the town. The apartment has shower with a WC. There is a large rooftop terrace. Especially in the early or late season you will find wonderful bathing bays with empty sandy beaches! Also great hiking possibilities are given. We would be happy to send you pictures of the house and surrounding area by mail! Further Details: Transfer: Easy distance from Thessaloniki airport about 135 km. We can organize your transfer on request. Car rental at the airport and our place Sarti possible. If necessary, please contact us, as the car rental tenants give us 10% on our house! We would like to introduce ourselves! My wife Despina and I have been running the Despina house we have built since 1993 with success! Our goal was to offer our guests a clean and appealing holiday experience and to contribute our experience. We can now refer to many satisfied guests and a large number of regular customers! We are both still in the pension age but still agile, the house together with our daughter who lives in the winter in Thessaloniki and also the studios rented to lead! My wife is Greek and we have been living in Munich since 1967. We are all season in Sarti. We would be delighted to welcome you as our guests! We have already before our property purchase in Sarti, already made 3 times vacation in this beautiful place with great enthusiasm! Our children also appreciated the beautiful sandy beaches and infrastructure. The Sithonia peninsula is still very natural and varied. Fantastic view to Mount Athos and the monasteries. Particularly the remote sandy beaches and the wonderful hiking trails in our direct environment are unique. Just in the cheaper and not so frequented before and after season of our guests very popular and used! We would be pleased to provide you with further information on the spot! Through the hillside glorious view of sea, place and mountains (Athos). But by the edge of the village much peace! Short distances to sandy beach and the localities and shops. Studios and balcony apartments with 2 separate bedrooms, for a more relaxing holiday on request. The good location and the wonderful and still natural environment have led us to create this object! Apartment no.45 has 2 WC / showers, TV, air conditioning, kitchens and balconies without sea view. There are sun loungers on the large roof terrace and you have the possibility to use the roof terrace kitchen or the outside grill. The village is located on the east coast of Sithonia on Chalkidiki. It has numerous restaurants, shopping possibilities and a clean sandy beach.